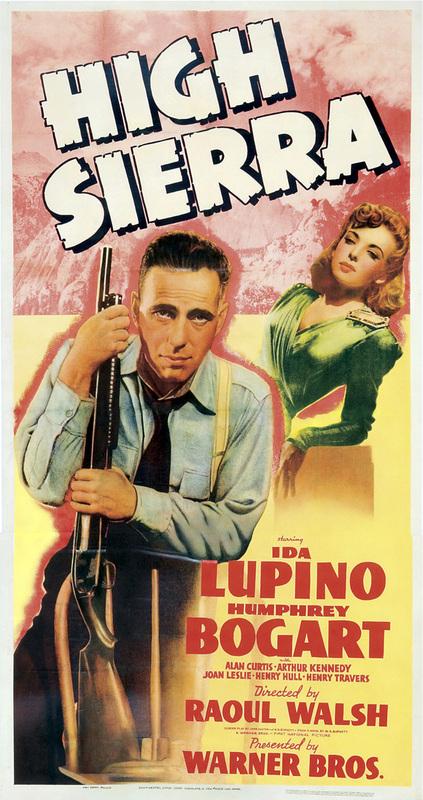 Today, I came back from working on a Saturday to see the end of Warner Brothers’ High Sierra (1941) with Martine. There was Roy “Mad Dog” Earle, trapped on an Eastern Sierra cliff face and surrounded by police and reporters waiting to put an end to his career of crime. I had seen the film so many times that it was now in my blood. It was one of a handful of U.S. films that defined for me the whole American experience between the 1930s and the 1950s. I thought I would put together a list of the films in the genre that were my favorites. If this seems like a long list, please note that I could have stretched it to fifty or a hundred without too much difficulty. There were a lot of noir films made in Hollywood over a long period. Film noir is grounded neither in personal creation nor in translation of another tradition into cinematic terms. Rather it is a self-contained reflection of American cultural preoccupations in film form. In short, it is the unique example of a wholly American film style. “Film noir” is literally “black film,” not just in the sense of reflecting a dark mood in American society, but equally, almost empirically, as a black slate on which the culture could inscribe its ills and in the process produce a catharsis to help relieve them. There is a whole galaxy of elements which, together or in unison, make up a film noir plot. They include crime, police, private detectives, “bad girls,” urban environments with “mean streets,” and both inner and outer darkness. This entry was posted in film and tagged film-noir. Bookmark the permalink. Great list here. Maltese Falcon, White Heat, High Sierra, The Big Sleep are long time favorites of mine. I’ve never heard or viewed some of the others on your list. Guess I’ll take a look at them too. Erin – Sam Fuller’s PICKUP ON SOUTH STREET sort of crosses over into the spy genre. Sam – There are two sleepers on my list: DETOUR and GUN CRAZY. Both are great. I’m not good with genres, but one movie I’m fond of is Bad Day at Black Rock. It’s not really a noir film, Dagny, more of a Western, actually. Thanks, Jim. Yes, I sort of thought it wasn’t quite noir, although I don’t really think of it as a western either. I tend to think of “ride ’em cowboy” as westerns.